The last few days have been pretty uneventful, to be fair, I've given myself days off. After being proactive for the last 2½ weeks and seeing a lot more than most do of Sydney, I felt I deserved a couple of lazy days. Saturday was the only day where I got up and out of bed in the morning. I was being taken into Ku-Ring-Gai Chase National Park, a place I was wanting to see but didn't think I'd get the chance to. It's a very pretty area, but void of a lot of transport links other than countless busses. So I appreciated my Grandma's cousin and his wife for driving me up there and showing me around. It was a perfect winters day for it, with not a cloud in the sky and temperatures coasting over 20°C. First stop was Westhead. It's a great little look out that gives stunning views over both Palm Beach and Lion Island. Lion Island I'm told is supposed to resemble a sitting Lion, I'm far from convinced however. After chilling at Westhead, we drove round Pittwater to Palm Beach. 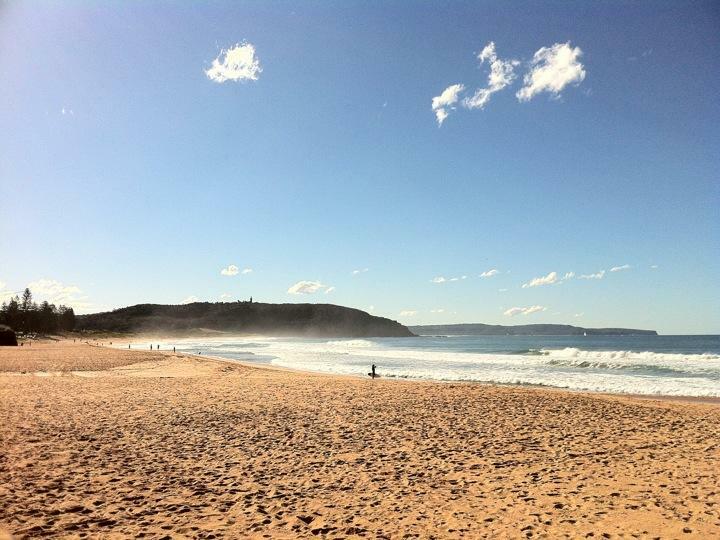 Palm Beach is where the exterior shots for Home and Away are filmed and the location for the Summer Bay Surf Club. Whilst Alf wasn't hanging around, it's a beautiful location and now I can say I've been here. Just need to tick the Neighbours set off my list next, whenever I visit Melbourne. After leaving Palm Beach we headed into the town of Newport and had lunch at a great pub called the Newport Arms. We had lovely views over the bay with lovely food and beer to go with that. Since lunch wasn't on me (I did offer) and it was recommended to me, I tried the Barramundi, which is an Australian fish and well worth the $24. I'm always saying I need to try more fish dishes, and I wasn't let down by this one, wonderfully done. Cruising down the coast we hit some views in Long Reef and Dee Why before heading back into the city and calling it a day. It was a great way to spend a Saturday and I'm happy to have seen some places I was wanting to but not expecting to. Saturday evening took me back on a train and into a part of Sydney I hadn't seen before, Newtown. I was here to meet up with a couple of friends who work for the Webzine I contribute music reviews to. They both live in Sydney and invited me along to a gig they were covering. It was great to finally meet them and see some music that I don't usually get the chance to hear live. Sunday was an incredibly lazy day that had me doing nothing, other than cashing in on a free $10 steak for my last dinner, eventful. Overall my time in Sydney has been amazing and it's jumped ahead of London to my favourite city in the world so far. With many more places to visit we'll see if it lasts. I'm currently at Sydney International Airport and not in the domestic terminal which does mean that I'm heading out of the country and coming home. This may come as a surprise to most, but when I land back in the UK on Tuesday, there'll be another update briefly outlining my very good reasons for not extending my stay past a holiday. For now I'm Hong Kong bound before catching another flight to Heathrow. Peace out.